As we are approaching 2017, it’s time to think of ways to make our websites more beautiful and effective. Every year new web design trends are emerging that define the way websites look. Some of them are here to stay longer, others go out of trend quickly. Parallax scrolling has been of the biggest trends recently. The effect involves the background moving slowly than the elements in the foreground. This gives a cool look of your website and if you use it sparingly, you can only benefit from it. In our opinion, more and more brands will use parallax scrolling on their websites. Combined with authentic photography and big, bold typography, it looks really great. If you’re using Oxxy as your website building platform, you can easily enable parallax scrolling to the stripe element and load an image as a background. Another big trend is the usage of GIFs on websites. Animations are a great way to communicate things and the usage of GIFs is an easy way to implement them in your web design. 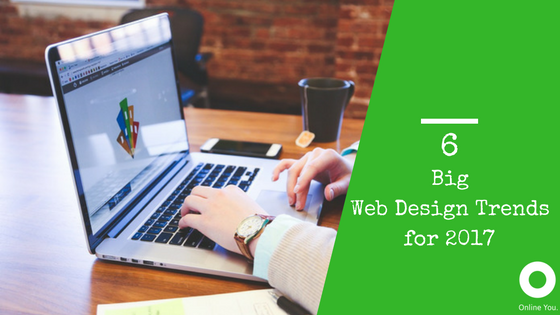 Our expectation is that in 2017 web designers will continue to use them as a way to reveal content and make it more sharable and visually attractive. A great implementation of GIFs is in the use of cimegraphas or the so called “moving photos”. You can learn more about them an how to properly use them on your website in our article for the purpose. The decline of stock photos has been a big trend in the recent years and there is no reason to believe it will fade in 2017. In the digital world, the competition is huge in almost every niche, which means that you really need something to stand out in the crowd. Using professional images is one of the best ways to do it. Stock images are a bad choice for several reasons. First of all, they look fake and can’t really show your true identity. Another drawback is that we’ve seen them on so many websites and tend not to trust a website using the same stock images over and over again. In the same time, authentic photos are always a good option as they can really show who you are. The only disadvantage is that it’s a bit more expensive as often you will need to hire a professional photographer. If you don’t have enough resources for authentic photographers and the only option is to use stock photos, there are some image banks that provide high quality original images that don’t look like stock photos. We can highly recommend you using Unsplash or Death to the Stock Photo. Big bold typography combined with video backgrounds, animations and authentic photos are a good way to make your website look modern and we think this trend will continue to be around in the next year as well. Along with images, typography is another thing you can experiment with in order to give your website more personality. If you are using Oxxy, you can choose among many Google Fonts. Experiment, find the best font to suit your website identity and give it a professional edge. Using both brighter colors and more gradients goes along with another big trend from the recent years – minimalism. More and more web designers are starting to experiments with brighter colors and gradients in order to make their websites more alive. If you are using dull and subtle colors, now is a good time to switch to a more colorful combination. Moreover, when it comes to colors, we can say that along with typography and images, they are another aspect that could reveal your true identity. As you may have noticed, we have mentioned the term “personality” several times in our article. This means that 2017 will be all about giving personality to your website and standing out from the competition. Websites have become more or less identical – all using minimalistic and flat design and now everybody is looking for ways to make his work more unique. Want to build a stunning website for you? Why not start now? Why Local SEO Matters (Infographic) We’ve often talked about the importance of Search Engine Optimization (SEO) in our blog.